We’re building up our collection of industry awards, accreditations and general accolades. You can also find out more about our awards nominations in our News section. We made the Comms National Awards shortlist again! This year we’ve been shortlisted again in the prestigious CNA’s. This time we’re finalists in the category of ‘Best SME Cloud Solution’, for our work with long term clients Barcan + Kirby. We’ve been working with VoIP and Hosted systems for years, so this recognition is warmly received and roundly deserved. Results are announced in October, our fingers are crossed! Solution IP are a participating company in the Ombudsman Service: Communications division. Approved by Ofcom, their purpose is to protect the rights of consumers in relation to their communications providers. Our participation is a sign of our commitment to our clients and our desire to act fairly and responsibly. We were finalists in the 2015 Comms National Awards. The Comms National Award for best SME vertical market solution looks beyond the supply of Information and Communications Technology products and services and recognises resellers that offer tailored applications to maximise their clients’ effectiveness. We were thrilled to be shortlisted for this prestigious award. Solution IP is a Trade Association Member of the ITSPA. ITSPA aims to promote competition and self-regulation in order to encourage the development of a flourishing and innovative VoIP industry. You can read Version 4.0 of the ITSPA consumer Code of Practice here. This version is in line with the Ofcom Code of Practice which became mandatory on 29th May 2007. Solution IP were finalists in the prestigious Comms Business Awards for 2015. These awards recognise industry excellence within the British Telecoms market, and finalists and winners are selected entirely on merit. We are extremely excited to be short-listed for this accolade, and believe it reflects on the quality of service we strive to offer at every opportunity. 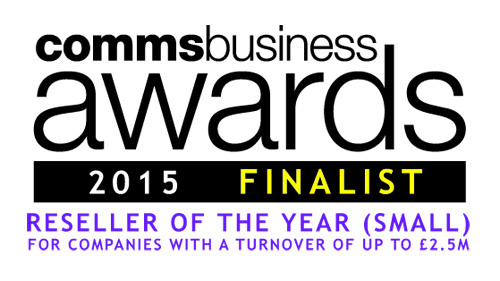 We were nominated for Reseller of the Year (Small).